Rep. Robyn Driscoll has introduced House Bill 191 to ban pit bulls in Montana, and a hearing was held Thursday afternoon. This is breed-specific legislation. It is of concern to many dog owners that Montana may be considering a breed-specific ban for pit bulls and rather silly considering a pit bull is not a breed recognized by any breed registry such as the AKC, UKC, or ADBA. The slang term, pit bull, can refer and has referred to at least 30 different breeds of dog. If you think you know what an American pit bull actually looks like, go to this Web site and see if you can pick the right one: www.understand-a-bull.com/Findthebull/findpitbull_v3.html.Then contact Driscoll and inform her that there are many breeds that can be and are mistaken for a pit bull. Statistics on pit bulls are greatly skewed making it appear as if the pit bull breed is inherently vicious or more dangerous. However, if actual breed determinations were made for attacking dogs instead of simply labeling them pit bulls, no one breed would emerge as more statistically likely to bite, attack or kill. It's been a great couple of weeks. Banned Aid has seen unprecedented support from across the dog world, places have rejected BSL and more. KC Dog Blog asks whether BSL is falling out of favour. I hope so, KC, I hope so because it's long overdue. A suspected dogfighting operation was busted in Steele, MO the other day. Police found five dogs described as 'pit bulls', $1,100 in cash (about enough for two large crates or a reno trip to the local building centre) and some sticks. "If you have five pit bulls they are either selling them, or training them to fight," [Captain] Alexander said. "People in the county need to start being responsible." Maybe these people are guilty, maybe they aren't. That will be decided in court. If they are, I hope the book thrown at them is a big one indeed. However, if you have five dogs people might think are 'pit bulls', don't be surprised if officers come knocking. I wonder if two or three might be enough to generate interest? Christina Blizzard at the Toronto Sun laments the escalation of government interference so nicely orchestrated by Dalton McGuinty and his friends in a piece entitled "Nanny State Clouds Our Lives". No argument here. She will be on TV Ontario's The Agenda tonight at 8:00 pm discussing the issue. TVO broadcasts online, if you're out of the province and interested. Although Canada had no fatal dog attacks in 2008 and has had none so far in 2009, the US has experienced five dog bite-related fatalities in the past three weeks. In Pennsylvania, eight-year-old Brianna Nicole Shanor was killed on January 19 by a 'rottweiler mix' owned by people she had been staying with since 'around January 6'. The story is a sad one about a child who deserved better. Is there anybody out there who still thinks these incidents are about dogs, or breeds? In Omaha, they are handing out citations under their new ordinance. Animal control officials say that 70 citations have been issued to Omaha canine owners since the city's new dangerous-dog restrictions went into effect. One man's Labrador retriever was taken away and destroyed after he didn't comply with the rules. 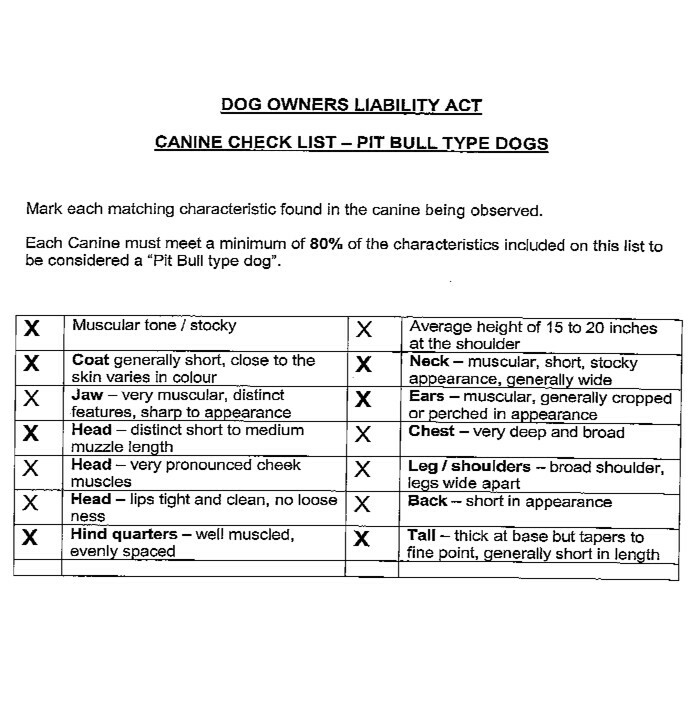 They claim they wanted to avoid BSL but 'pit bull' owners are subject to muzzling their dogs (or using harnesses, which is rather odd) unless they can pass a temperament test. If the dogs pass, the owners don't have to abide by the muzzling requirement. I actually get where they're coming from but if legislators are serious about wanting to reduce dog bites and attacks, they should apply the regulations to all dog owners across the board. Otherwise, it's nothing but theatre for the cheap seats. In other words, start upholding your own damned constitution(s). I have to go make some curry, like right now! I've held out for as long as I can today (which is all day as usual) so now it's time to eat. Back later with an update on how the fundraising is going and who has jumped onboard. KC has a great series this week about mandatory spay/neuter and its effectiveness in terms of bite reduction and numbers of dogs killed. He investigated San Francisco, California and Kansas City, Missouri (KCMO). It's excellent, lots of good information available. There's a link to an interesting study which I haven't had a chance to read yet but plan to get to ASAP. There has been more coverage of the story of Rambo, the pup found wandering on Christmas Day in Mississauga, Ontaristan. Visit the Mississauga News to get the updates. Some of the letters show that people are still buying into the whole 'pit bull' story. It's rather frightening to witness how easily people can be manipulated by those with less than savoury motives. This scenario has been repeated throughout history whenever somebody needs a scapegoat or wants to remove rights from free citizens. Only the names have changed. John Stewart, one of the few journalists I've seen who's covered this subject with anything close to integrity, is also blogging about Rambo at the MN's Random Access site. Here's a link to the blog archives - the Rambo entries are pretty obvious from the titles but I've linked three of them below. Don't miss the comments and please leave one yourself. Let's support John and the Mississauga News for straying from the party line on this one. When is a 'pit bull' not a 'pit bull'? Gotta go feed my dogs, Dash is in full managerial flight right now, howly-barking, flying ears, the whole schtick. Heads up if you live in Saskatchewan. The dog in the picture I posted yesterday was identified by media (those well respected scholars of dogdom) as a 'Rottweiler/Collie' cross. Today, he's a "Rottweiler cross." Funny how that always happens, isn't it? I put it up because I was interested in what dog people thought the mix could be. Incidentally, the dog is apparently small, which I didn't know yesterday, the picture makes him look pretty large. He's knee-high, so if you want to change your guess, be my guest. The dog bit a child who entered his yard without permission. Now the media are hyping the idea of a 'Rottweiler' ban in Saskatchewan. Here's yesterday's item from the Saskatoon Star Phoenix (pdf). 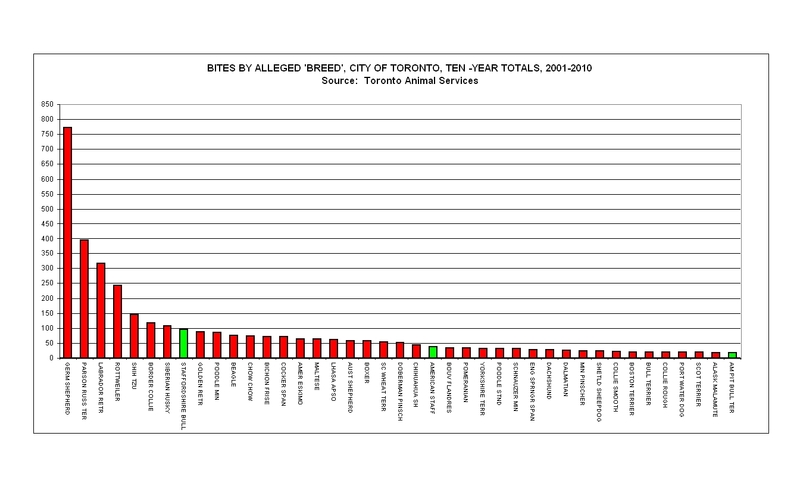 Where does the CFHS get its information, ie, that 'pit bulls' and 'rottweilers' are responsible for the most bites and attacks in Canada? It contradicts animal control records and the hospital records collated by the Canadian Hospitals Injury Reporting and Prevention Program (CHIRPP). It also contradicts fatality records. Of course, CFHS doesn't seem to be an animal welfare organization anymore, nudge nudge, wink wink. They appear to have branched out to where the real money is. Anyway, since this is going the way these things always go, there's more media instigation for a ban - provincial is on the table. Here's an alarming little essay by a writer who thinks bull-and-terriers are named after William Pitt. There are so many errors in this that it must qualify for an award of some sort. Just for fun, I'll emphasize them. The administrator for the Town of Delisle says a decision on whether to ban certain breeds of dogs may have to be an issue dealt with by the provincial government. Now, hold on there folks. Municipalities already have the authority to do that - why does Delisle (gas station, hotel, store and a few houses, pop around 200) want to export its non-problem? Besides, you're a little late to the party - hardly anybody believes in 'vicious' breeds anymore. Get with it. Mark Dubkowski says the issue will be on the agenda when the town council meets February 12th. He says it became an issue after 5 year old Jaidyn Solanik (so-LAN-ick) was attacked and bitten by her neighbours Rottweiler- cross dog. OK, I'm not following Dubkowski's logic here but thanks for the phonetics on the child's surname. A kid trespassed onto private property and got too close to the resident dog while unsupervised by an adult. She was, unfortunately, bitten. How does this have anything to do with 'breeds', banning breeds or any of the rest of it? If the dog had been a Cocker or a Golden or a Pomeranian, would there be calls for a 'ban'? That's a question people really need to ask themselves when these incidents occur. And just out of interest, how did the dog change in one day from a 'rottweiler/collie' mix (which was funny) to a 'rottweiler mix' (which is ludicrous)? You'll note I'm not capitalizing Rottweiler. And shouldn't they be banning Collies, too, just to be on the safe side? Dubkowski says the town is waiting for an RCMP investigation into the incident to be completed, hoping that will give them more information to work with. He says municipalities can place all the bans they want, but if pet shops continue to sell dangerous pets, the two sides will be at odds. So, what's the scoop? Are we banning pet shops? I don't actually have a problem with it, but it seems a bit over-the-top if based on a garden-variety dog bite case. It doesn't make sense - oops, there I go again. Dubkowski says it may be an issue the provincial government needs to decide for the entire province. Ontario has legislation banning Pitt Bulls while the city of Winnipeg banned dangerous dog breeds in 1990. In Saskatchewan, the town of Biggar passed a bylaw in 1991 banning Pitt Bulls, Rottweilers and Boxers. There are no dangerous dog breeds, only individual dangerous dogs. Oh, and news flash - 'pit bull' isn't a breed so I don't see how 'Pitt bull' can be one, unless William Pitt bred dogs (or cattle) and I'm just finding out about it. Or maybe it was Brad. It's too bad Jim forgot to mention that in the cases of Ontario and Winnipeg, dog bites increased significantly after their 'breed' bans went into place. I really should contact him and set him straight on some of this stuff so he can ask Dubkowski the right questions, such as "What are you smoking, Mark?" Moving right along, here's today's tale of the 'rottweiler cross' (LOL!) at the centre of our little controversy. I see they're running the picture again, which is helpful. Sue-Ann Levy, who is one of the best bureaucrat-harriers around, has been looking into Toronto Animal Services (TAS). She's uncovered a lot of questionable spending, a growing debt, an inability to report on activities and a complete failure to enforce licensing. TAS claims it has boosted licensing to around 15% of the dog population in Toronto. How they know this beats me. If you don't know how many dogs you have because you don't have licensing compliance, then how do you know when you've reached a particular number, in this case 15%? Maybe if people saw licensing as positive and worthwhile, rather than something to fear, they'd be more willing to buy tags. Maybe if TAS spent less time spinning their wheels, stopped throwing good money after bad and focused on enforcement and public education, their compliance would increase. Maybe if more people had stood up (or bent down depending on how tall you are) to Bryant and his band of unmitigated ignoramuses, resources wouldn't be wasted on harassment of 'pit bull' owners and endless court cases but could actually be put to some constructive use. Anyway, I'm pleased to see that Sue-Ann is a fellow Wiener Dog owner. I'm liking her more all the time. Another little klatsch in the middle of nowhere thinks they should talk about restricting 'pit bulls' in their town. Other places have done it, so they should too. That excuse is wearing pretty thin. The myth about 'bite pressure' surfaces here. I guess these people are unaware that the fairy tale in question was disproved in 1988 by Dr Lehr Brisbin and that his findings have never been refuted. They also seem to be unaware of the fact that 'pit bull' is not a breed. As we see with other little places, they only have about five 'pit bulls' and they have had no problems with 'pit bulls' but they want to be proactive, by cracky. We really have to get some of these laws overturned (donate to a legal fund today) and everyone should be alert to proposed changes in their area. It's easier to jump all over these clowns and hit them with science and proven facts before they get carried away with following the latest fashion in legislative discrimination and back themselves into a corner. At least Clinton had the sense to table the idea before things went too far. If you live in the area, heads up though - it will resurface on December 4. Peterborough has an awful lot of irresponsible dog owners, if - and it's a big 'if' - media reports can be believed. The latest involved a Labrador-type dog and a toddler. Update: What's with these dog-catchers? Maybe it's time to up the standards for that job. Lots of good, common sense on Council though. Councillor Walker sounds like a decent kind of guy. He tried to push for a 'pit bull' ordinance when he thought it would help prevent dog related problems in his Parish. Metro Councilman Mike Walker said he is abandoning his effort to pass breed-specific regulations aimed at pit bulls in East Baton Rouge Parish. “The ultimate object of all this is to get at least seven council votes for a stronger law. Well, I can’t do that if I stay breed-specific. Reality sets in,” he said. Walker said he asked the parish attorney’s office to remove all of the breed-specific provisions from his proposed ordinance, which is supposed to go before the full council Wednesday. Instead of targeting pit bulls, Walker said, he wants the regulations to apply to any breed of dog that bites someone or is deemed a dangerous or vicious dog due to behavioral problems. I got to thinking about the testimony at the (committee) meeting and the recommendations that were made; I think the statesmanly thing to do is the tweak this ordinance at this time before it ever goes before my colleagues on the council. I think my fellow council member will appreciate that, and are more likely to support it than if I had stuck with breed-specific provisions,” Walker said. Guess they don't whip the votes in East Baton Rouge. Good on them for coming to their senses. I sure wish Walker were our Attorney General here in Ontario. We could use somebody reasonable up here for a change, especially somebody who doesn't want to waste taxpayer dollars defending a half-baked scheme in the courts. Here's the article from 2TheAdvocate in Louisiana.